A guided tour of the wine cellars of Patriarche Beaune. The tour included a wine tasting session at the end. It is located at 5 Rue du Collège in Beaune, France. Patriarche is one of the largest and oldest vineyard winegrowing companies in Burgundy , Beaune , capital of Burgundy wines . 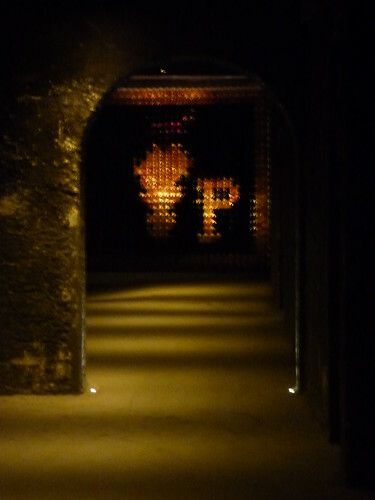 Each year it welcomes around 65,000 visitors to one of the largest cellars in Burgundy, on the Grands Crus route. In 1780 Jean-Baptiste Patriarche of Savigny-lès-Beaune in Burgundy , associated with " Joseph Bouchard Père & Fils " definitively founded in 1784 his family wine company " Patriarche Père & Fils " and established it in Beaune . In 1796 (28 Ventôse of the year IV ) he bought to set up his business there, the convent of Visitandines founded in 1632 , in the historical center of Beaune , become National property in 1789 during the French Revolution . In 1941 André Boisseaux and his son Jacques Boisseaux (descendants of the founder) took over the company Patriarche Père & Fils . In the 1950s , they founded the subsidiary group Kriter , one of the leading Burgundy manufacturers of sparkling and creamy Burgundy wines . In 1973 the Boisseaux family bought the Château de Meursault , then founded the Château de Marsannay in 1990 . In 2011 , except for the Château de Meursault and Château de Marsannay, and a few assets in Beaune, including the Athenaeum, the Couvent des Cordeliers wine cellar and the Marché aux Vins ..., André and Jacques Boisseaux sell Patriarche for an estimated 70 to € 90 million to the French Bordeaux group Castel (No. 3 in the world and the leading wine producer in France ). Patriarche sells more than 60 million bottles in France and worldwide with annual sales of more than € 110 million ( 2010 figures) with a wide range of appellations from the Burgundy vineyards and a major specialty in sparkling wines With its subsidiaries Kriter , Veuve du Vernay , Léonce Bocquet , Pol Rémy and Crémant de Bourgogne (2/3 of its production). In 2014 , Patriarche entrusted its two centuries of historical archives to the municipal archives of Beaune.